Perhaps the first "cosy" detective story. Has the distinction of being lauded by Dorothy Sayers and derided by Raymond Chandler. The plot is clever, and still works today, even if the setting seems alien to the modern reader. Extra points from me because E.C. Bentley was my great grandfather. Me ha gustado y recordado en parte a los libros de Agatha Christie, solo que este detective es algo peculiar. somewhere between a 4 and a 5, so we'll call it a high 4. No hay nada como comenzar el año con un buen libro. 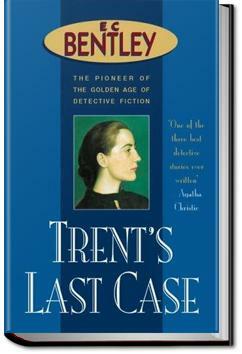 A Golden Age mystery with many, many twists and turns. Phillip Trent, a well known amateur sleuth is called in to investigate the murder of millionaire businessman Sigbee Manderson. I loved this book, & only one major plot hole (& a too long finale) stopped me giving it 5★! I thought this was a thirties mystery and found out half way through my read that it was a groundbreaking novel from 1913! Bentley, E. C. (Edmund Clerihew). (1913). ****.